Back Height From Seat 21.5"
Min Arm Height From Floor 26.5"
Max Arm Height From Floor 33.25"
Min Arm Height From Seat 6.75"
This chair was designed to meet your around the clock needs. Also known as multi-shift task chairs, a 24-hour office chair is designed for extended use or multiple-shift environments. This chair can be used in a 9-5 setting, but it was specifically designed to meet the needs of workers in 911 dispatch offices, nurses' stations, call centers, control room engineers, disc jockeys, and government personnel. The big and tall design also aids in accommodating larger and taller body types. This chair has been tested to hold a capacity of up to 350 lbs., offering a broader seat and back width. The chair offers support to the mid-to-upper back region. Mesh office chairs can keep you more productive throughout your work day with its comfort and ventilated design. This chair features an incredibly conforming and comfortable suspension seat that reduces the pressure from sitting. The synchro tilt control allows the chair's back and seat to recline at different rates, increasing the angle between your torso and thighs. Chair easily swivels 360 degrees to get the maximum use of your workspace without strain. The pneumatic adjustment on this chair offers a very smooth adjustment range to achieve your desired height. The adjustable armrests take the pressure off the shoulders and the neck, which minimizes the risk of pain. 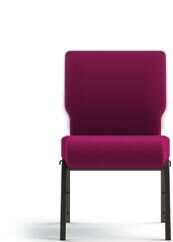 The heavy duty metal base is constructed to keep up with the demands of an intensive use chair.